Do you find trails of ants in your home? Do you have a recurring ant problem, yet you can’t seem to pinpoint the source ? 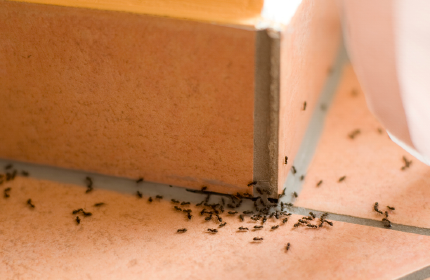 If your home seems to be overrun by ants, or even if it’s not, it’s important you stick to these 6 simple ways to ant-proof your home, so you can mitigate the problem before it turns into a nightmare. If, for any reason, you are leaving food out on the bench, ensure that it is well-covered to ward off ants. Nothing attracts pests more than a meal - and in the case of ants , they love any food that is left behind by humans! Not only does leaving out uncovered food encourage an ant infestation, but it will also ruin your meal! If you need to leave food out, cover it tightly with a lid, cling wrap or foil, or store it in a zip-locked bag or vacuum-sealed bag. What do ants and children have in common? They love trawling the kitchen for food! If there are leftovers about, like kids, ants are going to invade your kitchen and find it. If you spill food or drink in your kitchen, instead of leaving the mess there to attract pests, clean and disinfect the space as soon as it happens. The sight and smell of a garbage can attract many critters, including ants. Don’t encourage unwanted pests into your home. Make sure you keep the disposal of your garbage as hygienic as possible by sealing garbage cans, and tying up trash bags tightly and securely. Ants love pathways such as cracks and crevices, which can be in walls, window frames, pavement or flooring. To prevent ants using these handy entrances into your home, ensure you have sealed off any obvious access points. This can be done by fixing the crack with the material it’s made of or filling it in with putty or a similar substance. This involves wiping away food debris from under kitchen appliances and cleaning hard to reach places such as under beds and behind white goods. As well as this, it’s important to keep your pets clean and remove any remnants of pet food after your pets have finished eating. Ensuring that you keep your house clean and tidy on a regular basis will deter any pests, including ants, from taking up residence in your personal space. So you don’t bait ants into your house, it’s important that you keep your compost pile or bin as far from the house as possible. The odours coming from a compost bin attract all sorts of creatures, which can be a great thing for your compost to flourish. However, a compost pile can also attract ants, and if your compost is too close to your house or unenclosed, they could find a much better home by inhabiting your house! Sticking to these 6 helpful tips will ensure that your house is kept pest-free. If you already have a serious ant or pest problem, or you suspect that something may be amiss , it is important that you call the professionals. Pests are not our friends, and so they require dealing with in a safe and appropriate manner. If you need advice regarding ants or any other pests, call the friendly professionals at Dawson’s Pest Control today on (03) 9222 2266.